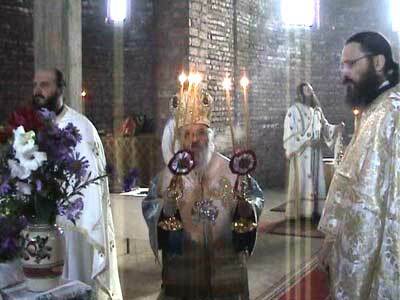 Bishop Artemije and the priests and monks of the Diocese of Raska-Prizren and Kosovo-Metohija served the first holy liturgy in Obilic yesterday since the arrival of KFOR troops to the area in celebration of the Nativity of the Most Holy Mother of God (Mala Gospojina). "The Holy Mother of God is also close to those of us gathered here, brothers and sisters. She knows of our suffering and our troubles. She sees this church built in Her name but still incomplete, and She prays to Her Son to bring us all together again in this church, as we once lived. The Holy Mother of God also prays to God that all the expelled may return to their hearths and that He may bestow upon those of us who stayed the strength and the patience to persist here, that our holy shrines may not lie deserted, that our cemeteries may not disappear from the face of the Earth, that the name of God may not be forgotten in the holy land of Kosovo and Metohija," said Bishop Artemije in his homily. "We must return to our faith and to ourselves on the path of our glorious predecessors and all martyrs and new martyrs in the sense that every one of us must be ready to live for his faith but also, if necessary, to die for it, too, as the Holy Prince Lazar, Deacon Avacum and many, many others of our freshest martyrs died: the Stolic family, here in Obilic, the children in Gorazdevac, the martyr in Cernica, as well as many other martyrs throughout Kosovo and Metohija. In recent times they gave their lives and their blood in testimony of the fact that this is holy land for Serbs and that it should remain so," Bishop Artemije concluded in his homily in Obilic. While returning from liturgy in the church in Obilic, a group of Kosovo journalists for Serbian language media were intercepted by a vehicle from which they received death threats. Journalists from KIM Radio and The Southern Voice (Glas Juga) told Beta news agency that a man wearing a camouflage uniform in a black VW Golf drew his finger across his throat upon leaving the center of Obilic and repeated the sign repeatedly as he slowed them down on the road to Pristina. "We couldn't overpass him. The man in the Golf stopped following us only when his vehicle struck a white van on the road to Pristina," the reporters told Beta. For security reasons they asked that their names not be given. The journalists from KIM radio and The Southern Voice attended liturgy in the Church of the Nativity of the Most Holy Mother of God (Mala Gospojina) served in Obilic by Bishop Artemije of Raska and Prizren for the first time since the arrival of KFOR and UNMIK in Kosovo. 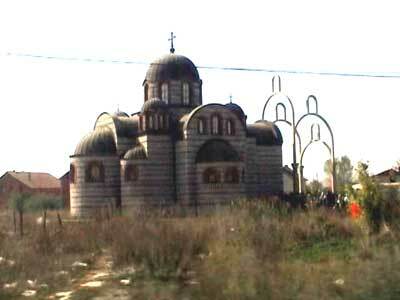 The liturgy was attended by several hundred Serbs from Obilic and the surrounding villages. 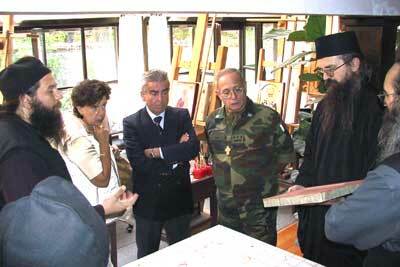 The KFOR commander, general Fabio Mini came for retreat to Decani Monastery during this weekend. Near the end of his one-day mandate, general Mini indicated that he wished to spend a few moments of spiritual reinvigoration in the monastery to which he remains especially close. General Mini reiterated, as on several previous occasions, the important commitment of Italian KFOR troops "to protect and preserve this holy shrine, a pearl of Christian architecture and art." General Mini also emphasized KFOR's willingness to assist in the process of returns of displaced persons and to do everything possible to stop the attacks against the civilian population, expressing the sincere hope that soon all residents of this area will live in peace and mutual tolerance. On behalf of the Decani brotherhood Abbot Teodosije thanked the Italian general for the help that members of Italian KFOR have provided thus far to Decani Monastery as well as other monasteries throughout upper Metohija (north-western part of today's Kosovo Province).